Above is an aerial shot of the cleanup support facility. MASSENA -- Construction work is expected to resume later this month on a facility to support the $243 million dredging project to clean up cancer-causing polychlorinated biphenyls (PCB) from the Grasse River upstream from its entry the St. Lawrence River. When constructed, the facility will be used as a staging area to support future dredging and capping operations. 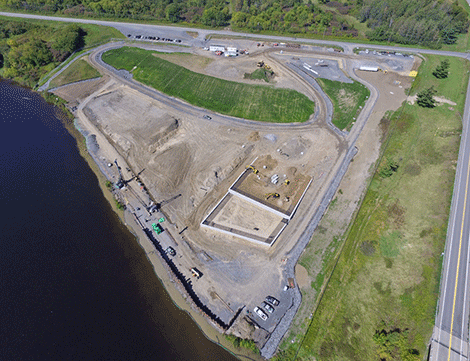 EPA will hold a public information session on May 16 from 7 to 8 p.m. at the Massena Community Center, 61 Beach St., to provide an update, and answer questions about construction of the cleanup support facility. The next meeting will be held in Akwesasne in June. Meetings will be held monthly in Massena or Akwesasne while the construction work is underway. Before dredging work can start, the facility must be constructed and engineering plans and other design work completed. Arconic (formerly part of Alcoa) is performing the cleanup work under an Environmental Protection Agency order. EPA, the New York State Department of Environmental Conservation, and the Saint Regis Mohawk Tribe are working together on the oversight and coordination of the various components of the cleanup project. In 2013, EPA selected a plan to clean up river sediment contaminated with polychlorinated biphenyls (PCBs) by dredging and capping of contaminated sediment in a 7.2-mile stretch of the Grasse River. The 2018 construction activities are expected to include completion of a sheet pile wall along the staging area riverfront and construction of a dock facility; removal of a small amount of sediment along the shoreline next to the staging area; removal of soil in two areas along the north shore of the river near the Alcoa Bridge; re-opening of the secure landfill for the disposal of shoreline sediment and soil; and performance of an in-river capping test in small areas near the staging area. Plans to protect the health and safety of the workers and area communities will be in place while the construction work is underway. The air and river water will be monitored during the work. A traffic management plan has been developed to minimize the increased truck traffic at and near the staging area. With the exception of the collection of river water samples, and the in-river capping test, all of the work being conducted in 2018 will be performed by land and is not expected to impact recreational boating on the Grasse River, according to an EPA news release. Under the EPA’s 2013 cleanup plan, approximately 109,000 cubic yards of sediment will be dredged from near-shore areas of the river. In the river’s main channel, approximately 59 acres of sediment will be covered with an armored cap and another approximately 225 acres of contaminated sediment will be capped with a mix of clean sand and topsoil to isolate the contamination from the surrounding environment. In spring 2017, Arconic began construction of a staging area that will be used to unload the sediment dredged from areas near the shore of the river. The staging area is located next to the river, near the intersection of County Route 42 and Route 131 in Massena. Arconic also expanded the permitted, licensed on-site Arconic Massena West landfill so that it can store dredged sediment and other materials generated during the construction work and when the river cleanup work is performed.